Würzburger Hofbräu | Beer Apprentice - Craft Beer News, Reviews, Interviews and Info. Hello again everyone. I hope you guys are doing well. Well, with Summer in full swing in my neck of the woods I figured that it would be fitting to taste test the Julius Echter Hefe-Weiss produced by Würzburger Hofbräu AG located in Würzburg, Germany. I don’t recall ever having this particular beer nor do I ever recall ever having a beer from this brewery period, so I’m eager to see what we have in the bottle. From the website, http://www.wuerzburger-hofbraeu.de, I found this quaint description. A classic wheat beer of particularly high quality. Brewed with fine top fermented yeast and with a particularly well-rounded, soft taste. Ok. Let’s get it into a glass. This brew came in a 16.9 oz. bottle with an ABV of around 4.9%. It had the typical Hefe appearance once it was poured into the glass. It was a hazy, orangish/yellow color with a well sized white head. The texture was both soft and smooth. The retention time and the lacing were better than average in my opinion also. The aroma was very interesting on the initial whiff. It kind of smelled like popcorn. Crazy!!! It wasn’t a bad smell because I love the fragrance of popcorn, but it was a bit puzzling. After a few more deep inhales the popcorn dissipated and I began to pick up on the tones of wheat, spicy coriander and hints of light banana. It also seemed to be quite yeasty with a slightly sweet smelling component. The banana was a little more forthcoming in the taste than it was in the nose. The flavor was more straightforward and conventional too. In other words… no popcorn. Solid stabs of wheat and yeast while a suitable dollop of coriander spice finished it off. The mouthfeel was of the medium/thin variety. Rather refreshing, crisp and thirst quenching with a semi-watery consistency. The carbonation was of medium strength, yet only an “ok” amount of flavor was left behind after each gulp of the liquid. Overall, I found this to be a pretty good beer. It’s worth a try for sure. Especially during the scorching hot days of Summer. It totally hit the spot. The drinkability was great and I liked the fact that the fruity aspects didn’t dominate the brew like a lot of others of this style tend to do. It was significantly more balanced with the wheat and yeast. However, some may not like that feature I guess. Some may prefer the heavy spice and bright fruits. 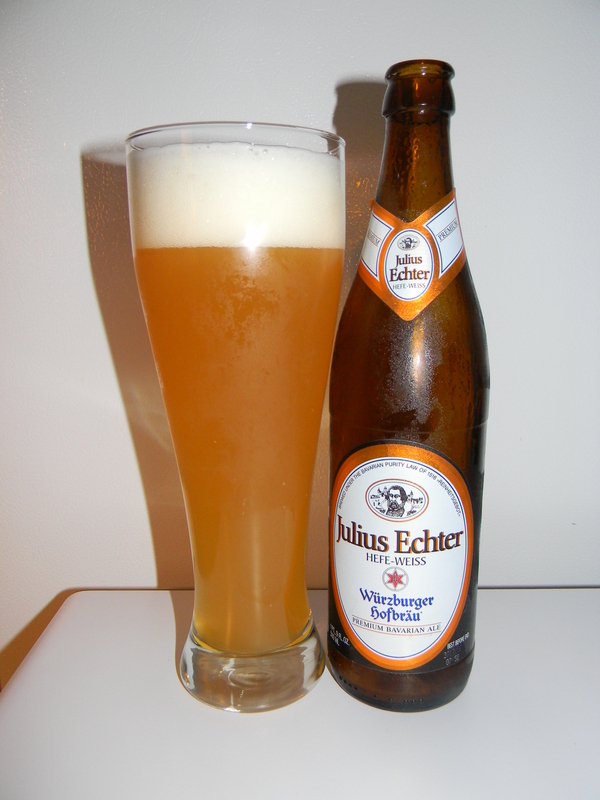 Oh well, give the Julius Echter Hefe-Weiss a try anyway and see how you like it. Be sure to leave a comment and tell me of your experience when you do.